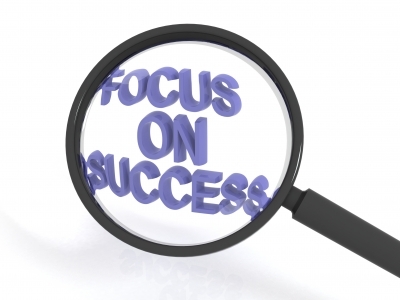 Lately, the word “focus” has come up repeatedly as essential to identifying and achieving business success. I know I struggle in this area in starting Professional Project Services. There are so many fun and exciting things to do, who can pick where to start? Last Saturday I made the right decision on where to spend my energy. I saw the date for an event creeping up on my calendar and had a hard time getting excited. I hoped that it turned out to be an inspiring morning and happily, I was not let down. The National Speakers Association Northwest event was a four-hour seminar lead by Mark LeBlanc on Growing Your Business When You are the Business. I walked away with two simple strategies involving “focus” that will help me become more profitable with my business in less time. The first strategy is to focus on the single “profit center” that will most help you meet your financial targets for the month. These do not have to be big things. In fact, Mark says he rarely spends more than an hour a day working on his three baby steps each day. Just do three things that will support generating new revenue in that area. The other strategy is the idea to reach out to connect with one contact in support of your primary business each day. Mark recommends that this be a phone call and I can see how much more meaningful that phone call will be compared to an email or social network tools. I have written in earlier posts about how powerful a connection can prove to be without any insight and or idea of what benefits they can bring. You help make sure that your connections remain your connections by reaching out to – remind them that you are out there with the services you offer and gain insights into where you could be of help in their lives. I have many ideas when it comes to what I want to do in my business and often feel like a pinball in deciding what to work on each day. My 3-5 year vision is that I am on the speaking circuit and writing books to help project professionals and leaders realize the greatest success in the projects they take on. My project experience tells me that greater success comes from focusing on the activities that will bring the biggest benefit to my business. What brings me the biggest value five years from now is not what is of value to build my business and reputation as I work toward that long-term vision. Instead, I need to ask myself, “What is most valuable to me today?” Hearing Mark’s strategies is what has convinced me I need to adjust my short-term focus. Each day I will do three things, plus make one contact, that help me book technical training events for project managers and business analysts. My other business strategies will benefit from this focus and help me to achieve my vision. Have you experienced this? You buy a new car, a make and model you had not paid any particular attention to in the past. All of a sudden, you see your new car everywhere. That is what has happened to me since I had this Mark inspired epiphany on my business. Yesterday I ran across an article on Harvard Business Review that talks about how Steve Jobs turned Apple around by making them streamline their product line and focus on what their consumers needed most. Then today again, I get my highly anticipated CBSNews email and find an article on Three Key Mistakes to Avoid in Setting Goals. Can you guess what number 2 on the list was? That is right, too many goals. We need focus. You can help. I am looking for opportunities to go on the road to speak. I would love to come to your local PMI or IIBA event to a present any of my one-hour presentations. I am working on solidifying the curriculum on a program specifically designed for Business Analysts. I will offer this BA training in your local area as part of my travel plan. I may ask for a little help in marketing the program in your area as well. Just one more tiny favor to ask. Please check out Mark’s website and found out how he can help you or your organization.